ePortfolio software applications provide a range of functionality that can be used to provide students with structured learning experiences and assessment at individual and group level. To date, the authors have varied their use of ePortfolios in three units, postgraduate and undergraduate, and evaluated the outcomes from student and staff perspectives. Two key intended outcomes from the staff perspective are that individual students analyse and reflect on their contribution to group tasks and that the ePortfolio provides evidence of their individual contribution and enable individualised assessment of group work. This paper describes the use of ePortfolios in two postgraduate and one undergraduate unit. Students enrolled in the postgraduate units submitted two ePortfolios for assessment, each weighted 10%, describing their contribution and reflecting on group practice to provide evidence of contribution to their group. Students in the undergraduate unit submitted an individual ePortfolio as a 20% component of a group assignment worth 30% (six possible marks). In both cases, students were required to use the PebblePad ePortfolio software and access it via a link separate from the University Learning Management System (LMS). From a staff perspective, the objective of using ePortfolio assessment to provide evidence of individual contribution was realised. It facilitated the identification and individual assessment of students whose lack of contribution had not contributed to the group output being assessed. This evidence then resulted in the marks for the group assessment being realigned without the need for face-to-face negotiation and possible confrontation. Postgraduate students responded well to the use of ePortfolios as a separate assessment task with substantial weighting. ePortfolios were integrated with the other assessment pieces providing a holistic approach to the assessment process. However the undergraduate student responses in the unit evaluation provided evidence that the cognitive load required to learn PebblePad software was considered unreasonable for a 6% weighting. Using the ePortfolio as a component of a group assignment integrated into the assessment has clear benefits in individualising group work. 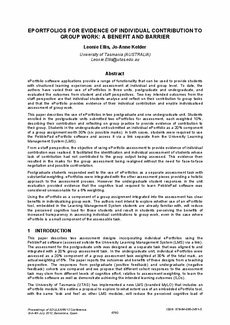 The authors next intend to explore whether use of an ePortfolio tool, embedded in the Learning Management System students are already familiar with, will reduce the perceived cognitive load for those students and result in students perceiving the benefits of increased transparency in assessing individual contributions to group work, even in the case where ePortfolio is a small component of the assessable task.